What do Janitorial Companies do? Janitorial services use a number of cleaning tools. Large companies frequently contract janitorial services to clean and maintain their buildings. Janitorial companies provide a range of services based on their areas of expertise and the needs and budgets of their clients. Fundamental tasks provided by janitorial services include sweeping, vacuuming, dusting and trash removal. The designated areas for cleaning typically include offices, hallways, lobbies, lunchrooms and restrooms. Landscape workers or groundskeepers normally clean outside areas. Janitorial services usually offer more intense cleaning options. In addition to the basic service, they mop tile floors, wax and buff hardwood floors, wash windows and replace light bulbs and fluorescent light tubes. The additional services are generally performed on an as-needed basis or scheduled for weekly or monthly completion. Fresh Cleaning Management’s steam cleaning division provides superb quality to any size project. Whether a lobby or hall way, commercial or residential, your satisfaction in guaranteed. We are conveniently available 24 hours for emergency services, or overnight projects. Is Regular Carpet Cleaning Important? One of the most importance home maintenance duties that must not be missed is carpet cleaning. Fibers in a carpet are very thick and dust hides to its very core. Changing a carpet often is very expensive. Hence they should be cleaned after e certain period of time. Although the process is time consuming, yet a must-do task for every homeowner. You can either clean it by chemical agents or vacuum it. If you are busy you can always hire a carpet cleaning company. Let's take a look at the various importance of carpet cleaning. This is perhaps the most important benefit of cleaning carpets. Generally, carpets act as a giant filter for trapping dust, allergens and dirt. The trapped dust particles are attractive to the insects since they are quite similar to the natural habitat of insects. Often, beetles, bugs and other insects nest in the carpet and if it is left uncleaned for long, their starts feeding on the fibers and slowly, ruin the carpet. Not only this, then creates a foul smell inside the house which is very uncomfortable if you have small children or guests in your home. Fungal elements and molds find an excellent breeding site in a carpet that is left uncleaned for a long time. In areas where humidity is high, dirty carpets when exposed to moisture encourages fungal contamination. Moisture slowly sinks in the carpet fiber and forms a natural breeding ground for molds. Molds are responsible for diseases like skin allergy and extremely hazardous for young children. It can also cause skin infection in adults. With regular cleaning, you can easily prevent mold formation in your carpet. The chemicals used either by you or any professional carpet cleaning services are effective enough to destroy the source of fungal formation. Often professional carpet cleaners have heavily powered drying tools that are capable for complete elimination of moisture. Another benefit of thorough and regular cleaning of carpets is the proper maintenance of the material. As we have discussed before, carpets serve as an excellent filter for dust particles. These sand and dust particles have ragged edges which have a large contribution towards the wearing and tearing of the fibers. If you constantly use the carpet without cleaning, you will notice a distortion in its form. However, if you clean it after a scheduled time period, it can increase the life expectancy of your carpet up to 4 times. Cleaning is also important since most manufacturers may cancel your carpet warranty if it is not cleaned by a professional carpet cleaning service at least once in a year. Not only all these, if you clean the carpet regularly, it also promotes the movement of leg and arm muscles. There by adding some extra hours of physical exercise. Besides, it also prevents the formation of toxic pollutants and health problems in dust infested areas. Hence, for the benefit of your health or the beauty of your home, it is always important to clean your carpet after a scheduled time interval either by yourself or a professional cleaning service. "Your Floor should be like an art canvas, keeping it like the first day it was installed is our mission here at Fresh." Maintain your floor's natural luster and quality with Fresh cleaning and restoration. Your guests are sure to be impressed! Regular care keeps terrazzo looking beautiful. Terrazzo, which means terraces in Italian, has its roots in 15th century Italy. Originally used to make terraces around the home, today it is used inside the home, in hospitals and in many commercial settings. With proper care and regular maintenance, terrazzo floors will retain their beauty and last many years. Terrazzo flooring is made with chips of marble, granite or glass and bound together with cement. Because of its porous nature, the cement part of terrazzo is easily penetrated and can become stained. It is important to apply two coats of a water-based, non-slip sealer after installation. The sealer is absorbed and helps reduce staining. If left unattended, spills can damage the surface. Spills with harsh cleaners, carbonated drinks, fruit juices or pet accidents can etch the surface if not wiped up immediately. High-traffic areas are also susceptible to damage. The dirt and soil that is tracked in can easily scratch terrazzo. Using mats inside and outside entryways helps to minimize the damage. Terrazzo floors require daily dust mopping with a dry, non-treated mop to pick up dust, cut down on soil buildup and scratches. Depending on the amount of foot traffic, occasional mopping is necessary. Mop the floors with a cleaner specifically made for terrazzo; regular household cleaners can damage the surface. For areas with stubborn stains or dirt, an electric scrubber works well. Buffing and polishing terrazzo periodically helps maintain its sheen. Nothing says luxury and elegance quite like acres of polished marble— particularly in the lobby of an upscale co-op or condo building. Marble has been used in palaces, temples, and homes for thousands of years, and is prized for its beauty, durability, and vast variety of colors and patterns. Stone floors need maintenance, however, and knowing what they need can make them look better and last longer. Since a highly-polished marble can scratch, Gottesman says that if a building wants a very shiny, clean appearance it’s important to have a professional come in routinely for sanding, honing, and polishing to maintain a mirror finish and buff out particularly deep cracks. For a free estimate call 786-543-8928 or 954-696-6616. Pressure cleaning is the most effective way of cleaning outdoor areas without causing damage to landscaping or surrounding areas. With over 4000 psi, professional care is crucial in ensuring areas remain intact, yet completely clean. 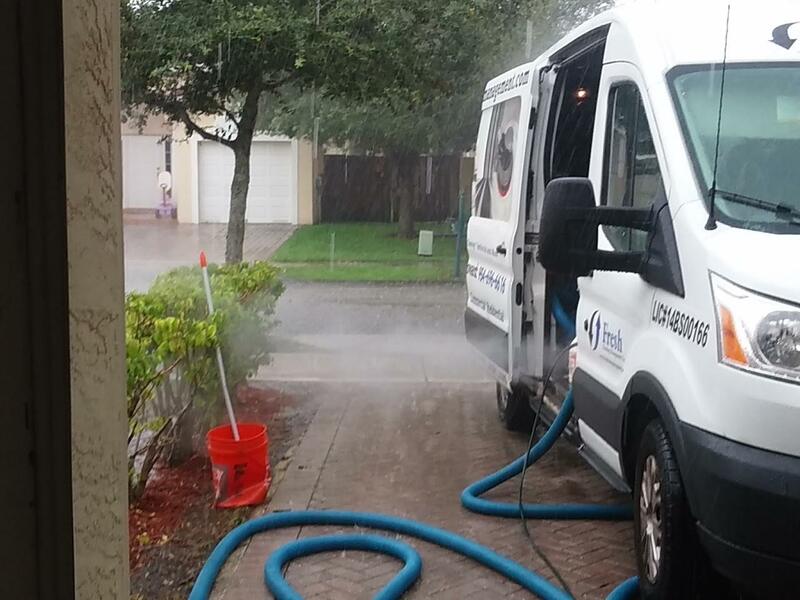 Trust our professionally trained staff with your pressure cleaning projects. Because we are a full service Janitorial company, Fresh will deliver the best quality service at the best price, guaranteed. *Licensed and insured for your protection and peace of mind. Ask us how you can save by contracting your periodic cleaning services. A pressure washer is a high pressure mechanical sprayer used to remove loose paint, mold, grime, dust, mud, and dirt from surfaces and objects such as buildings, vehicles and concrete surfaces. The volume of a pressure washer is expressed in gallons or liters per minute, often designed into the pump and not variable. The pressure, expressed in pounds per square inch, pascals, or bar (deprecated but in common usage), is designed into the pump but can be varied by adjusting the unloader valve. Machines that produce pressures from 750 to 30,000 psi (5 to 200 MPa) or more are available. Just as a garden hose nozzle is used to increase the velocity of water, a pressure washer creates high pressure and velocity. The pump cannot draw more water from the pipe to which the washer is connected than that source can provide: the water supply must be adequate for the machine connected to it, as water starvation leads to cavitation damage of the pump elements. Different types of nozzle are available for different application. Some nozzles create a water jet that is in a triangular plane (fan pattern), others emit a thin jet of water that spirals around rapidly (cone pattern). Nozzles that deliver a higher flow rate lower the output pressure. Most nozzles attach directly to the trigger gun. Some washers, with an appropriate nozzle, allow detergent to be introduced into the water stream, assisting in the cleaning process. Two types of chemical injectors are available — a high-pressure injector that introduces the chemical after the water leaves the pump (a downstream injector) and a low-pressure injector that introduces the chemical before water enters the pump (an upstream injector). The type of injector used is related to the type of detergent used, as there are many chemicals that will damage a pump if an upstream injector is used. Washers are dangerous tools and should be operated with due regard to safety instructions. The water pressure near the nozzle is powerful enough to strip flesh from bone. Particles in the water supply are ejected from the nozzle at great velocities. The cleaning process can propel objects dislodged from the surface being cleaned, also at great velocities. Pressure washers have a tendency to break up tarmac if aimed directly at it, due to high pressure water entering cracks and voids in the surface. Most consumer washers are electric- or petrol-powered. The electric ones plug into a normal outlet, use cold tap water and typically deliver pressure up to about 2,000 psi (140 bar). Petrol washers can deliver twice that pressure, but due to the hazardous nature of the engine exhaust they are unsuitable for enclosed or indoor areas. Some models can generate hot water, which can be ideal for loosening and removing oil and grease.